I have to confess; I’m one of the lazy travellers who leaves everything to the last minute. This includes getting foreign currencies, and often my only remaining option given the time constraint was to patronise a money-changer at Changi Airport. Given the poorer exchange rates at the airport, I try to delude myself that I’m paying more for the convenience; because I don’t have time to visit a money-changer anywhere else in Singapore. How much does this “convenience” generally cost though? To find out, we tracked the exchange rates at the airport for the 18 available currencies for 1 week. 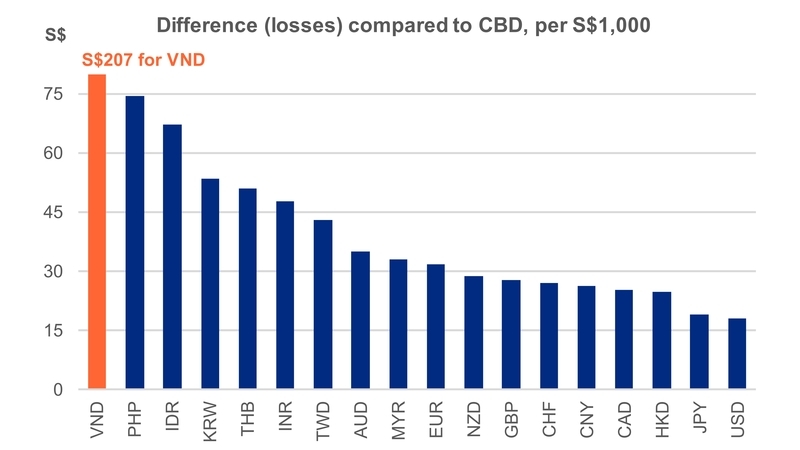 We then compared the exchange rates from the airport against the average of several reasonably competitive money-changers located in the central business district (CBD), and assumed a transaction amount of S$1,000. The results are plotted in descending order, and the largest difference observed was for the Vietnamese Dong (VND). Based on this dataset, for every S$1,000 worth of VND you purchase at Changi Airport vs. a reasonably competitive money-changer in the CBD, you would lose approximately 20.7%, or a staggering S$207! You’re even better off paying with credit cards, but then again, most places in Vietnam do not accept credit cards. Even if you’re getting a smaller amount like S$300 worth of VND, you’d still lose S$62. The smallest difference observed was unsurprisingly the USD, at “only” S$18 for every S$1,000 worth exchanged. Its arguably bearable if you only need a small amount (S$300), losing “only” S$5. While most of us would prefer to save money, some consumers might consider this S$5 as a small amount compared to their overall expenses. It is still up to you as the consumer to decide if your time and effort is worth paying this additional amount. But remember, a dollar is still a dollar! Why waste it if you can save it ? How can Thin Margin help you? Getting your foreign currency at the airport may be easier for those who don’t want to waste time and effort travelling to a possibly inconveniently located money-changer (not to mention the ATM and queues), but this convenience comes at a very high price. Remember, Thin Margin delivers foreign currencies right to your doorstep at competitive rates; definitely far more competitive than the rates at the airport or money-changers in most neighbourhoods. Save both time and money today! What are the charges for using your card overseas? How are the foreign exchange rates determined?